Now let’s make a bowstring. Remember that you are using either wet rawhide or artificial sinew for your first attempt. 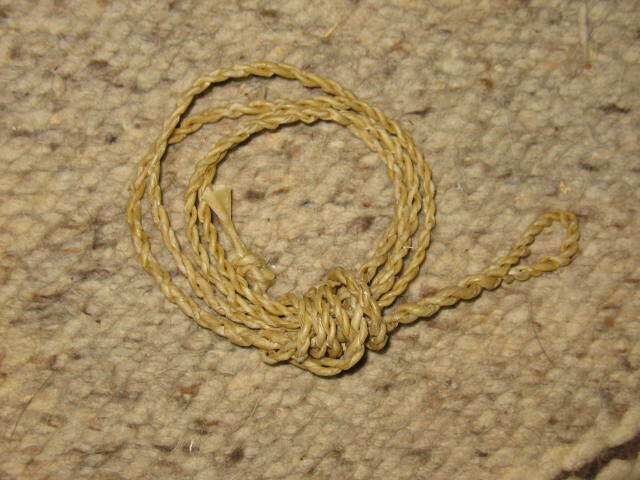 All cordage is twisted up using the same basic technique. It is called the reverse wrap. Using the reverse wrap takes only a few simple steps, but it will take a fair amount of practice to prefect the technique. Yucca leaf fibers are used in the following description, however the same basic steps apply to wet rawhide or artificial sinew. The only difference is that you won’t have to worry about splices, so there is no need to stagger your fibers as outlined in step three below. If you are using artificial sinew, just start out with four pieces of sinew that are three times the length of your unstrung bow and proceed to step 4. If you are using rawhide, start with a single strip that is three times the length of you unstrung bow and proceed to step 4. 1. Decide how thick you want your finished cord to be and use half that number of fibers to start with. For example, if you want your finished cord to be as thick as 12 strips of yucca fiber, you will start out with 6 strips of yucca fiber laid out on the table in front of you. All of the big ends of the fibers are on the left, and all of the small ends point to the right. 2. Now take 3 of your 6 strips and turn them so that the big ends are on the right and the points are to the left. 3. ext you will need to take all six strips and place them so that the ends are all off-set from each other. This is very important. Everywhere that one fiber ends, a new fiber must begin, and this obviously creates a weak spot in your cordage. If all of the fibers ended at the same spot and new ones began, you would have a tremendously weak spot that would come apart when the first stress was applied. By off-setting all of the fibers, you make sure that you will have no more than one splice occurring at any point on the cord. 5. Keeping a tight grip with your left thumb and index finger, grasp the upper bundleof fibers with your right fingers and twist them up and away from you several times so that they form a tight strand. 6. Now pull this upper strand of fibers toward you and down so that it crosses over the lower bundle of fibers. Shift your grip with your left thumb and index finger so that you are now pinching the two different strands where they cross. 7. Use your right fingers to grasp the bundle of fibers that is on top now (the ones that you haven’t twisted yet). Twist them up and away from you several times until they form a tight strand. 8. Now take this newly twisted strand and pull it toward you and down so that it crosses over the lower strand of fibers. 9. Shift the grip with your left thumb and index finger so that you are pinching the two strands where they cross. 10. Repeat steps 5 through 9. That’s all there is to it. After you’ve made a few strings with solid material you may want to try putting one together using yucca fibers or real sinew. This requires a lot of splicing to make a proper string, and if you’re going to try this let me recommend that you read Jim Hamm’s chapter on the subject in his very excellent book, Bows and Arrows of the Native Americans. 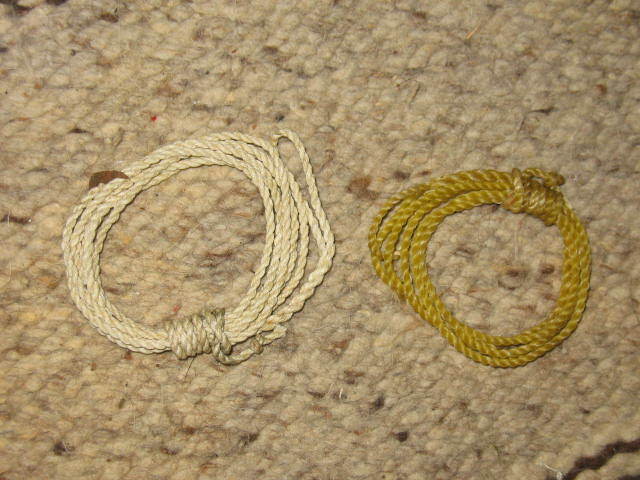 Pictured below: (1) Rawhide bowstring (2) Linen bowstring and artificial sinew bowstring. Now you have a good bow. In the future I will post about three articles on how to make primitive arrows, but for now I will return to posting on sensible modern survival topics. great instruction inspired me to give it a try. I cut a small hickory about 4 months ago, and just finished a 54″ bow tillered and strung today. I bought a commercial 50″ string and a couple of 28″ carbon arrows one of which I promptly lost. My concern is, it’s shooting quite a bit high and right and I don’t know what to adjust or how. any ideas? Shooting a primitive bow is considerably different from shooting a modern center shot bow. When the arrow leaves the string, the width of the handle causes it to shoot somewhat to the right. The arrow will straighten out in flight to an extent. This whole process is referred to as archer’s paradox. As for shooting high or low, most primitive bows don’t have an arrow rest on the handle or a nocking bead on the string; so it is important when nocking an arrow to make sure that the shaft is at a ninety degree angle from the string and the bow. The main thing is to practice, practice, and practice. You will make slight and natural adjustments to your aim as you shoot more and more. Start off by using the same bow and arrows and shooting from the same distance over and over. You will see your groups tighten up. Instinctive shooting is a life-long learning process.